In ECMAScript 5 we now have two distinct kinds of properties. A property is a named collection of attributes. Any attempts to delete the property or change its (writable, configurable, or enumerable) attributes will fail if set to false. if using strict mode, we get a run time error. the deletion attempt is ignored. -It can not be re-set to true. -We can change the value and writable attributes, but writable only from true to false. The property will be enumerated over when a for-in loop is encountered if set to true. if using strict mode, it’s as if the property doesn’t exist, it’s ignored. the boolean attributes will all default to true. the boolean attributes will all default to false. I was wondering about this, as I had heard conflicting stories. Properties declared the old ES3 way are configurable (can be deleted). Properties declared using Object.defineProperty; by default are not configurable (can not be deleted). The delete operator is used to remove a property from an object. It does not touch properties in the prototype chain. If you have a prototype that has a property with the same name, it will now be used when your code references the derived object’s property that no longer exists. Thanks to Angus Croll for pointing this out as untrue. // Nope, obj2 was not deleted. // Uncaught SyntaxError: Delete of an unqualified identifier in strict mode. you are actually defining a property of the global object. If you use the var keyword on that global, you are still creating a property. That property is non-configurable (can not be deleted with the delete operator). Only object properties with the configurable option set to true can be deleted. Nothing else can be deleted. Variables which are properties that we can’t access their property descriptor, can never be deleted. 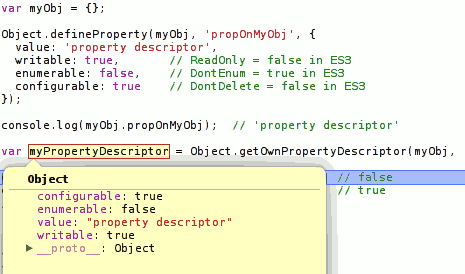 There are a couple of notable internal properties that are found on all ES3 and ES5 objects. The Ecma specs enclose internal properties in double square brackets as a convention only. In ES3 [[Get]] and [[Put]] are used to return and set the internal [[Value]] property. According to the Ecma5 spec, the internal [[Get]] and [[Put]] properties appear to do the same thing, although it’s not stated explicitly. This may just be an oversight of the spec. All the examples so far have been showing data properties. in which case they are defined as accessor properties. There are two attributes that are distinct to accessor properties. Both of which allow a method (and only a method) to be assigned to them to get or set respectively. Internally the getter calls the functions internal [[Call]] method with no arguments. Internally the setter calls the functions internal [[Call]] method with an arguments list containing the assigned value as its sole argument. The setter may but is not required to have an effect on the value returned by subsequent calls to the properties internal [[Get]] method. So these attributes may or may not leverage the internal [[Get]] and [[Put]] properties that are found in ES3 and ES5 on all objects. You can in fact define only a getter (readonly), or only a setter (write-only) accessor if you so choose. Can we create a data (default) property and then change it to be an accessor property? // Add a nonenumerable data property x with value 1. // what happens if we change configurable to false? // providing we haven't set configurable to false as above. Ok, so what does a property descriptor of an Accessor Property look like? Why are undefined, Infinity and NaN not removed? Are Infinity, NaN and undefined reserved words? I’ll answer these questions shortly. 8.6 “Each property consists of a name, a value and a set of attributes”. These attributes along with others (see ES3 spec) are reserved for internal use. ReadOnly The property is a read-only property. Attempts by ECMAScript code to write to the property will be ignored. DontDelete Attempts to delete the property will be ignored. Internal Internal properties have no name and are not directly accessible via the property accessor operators. This means the property is not accessible to the ECMAScript program. How these properties are accessed is implementation specific. How and when some of these properties are used is specified by the language specification. There are a number of ways to access the internal [[Prototype]] property indirectly. I’ve detailed them in my post on prototypes here. writable, enumerable and configurable replace the ES3 property attributes: ReadOnly, DontEnum, DontDelete. The property attributes and their values define the property descriptor object (including Data or Accessor properties and those that apply to both (enumerable and configurable)). // getOwnPropertyDescriptor is the only way to get the properties attributes. // they're stored internally in the ECMAScript engine. There’s lots of new methods defined in ES5. Now, back to the six questions we had above. Because their property descriptors configurable attribute is set to false. Because their property descriptors writable attribute is set to false. No. Avoid using their names to remove ambiguity. Infinity read/write (the value can be changed). Holds positive infinity. —Number is a property on the global object, which has readonly properties Infinity and NaN. NaN read/write (the value can be changed). —Infinity is also declared directly on the global object. undefined is a property on the global object with the value (you guessed it) undefined. These are all constants now. Variables are properties, but not vice versa. The VariableObject in ES3 is called the VariableEnvironment in ES5. Can be seen in the specs. Not sure why they changed what they called it. Each execution context (be it global or any function) has an associated VariableObject. Variables (and functions) created within a given context are bound as properties of that context’s VariableObject. Even function parameters are added as properties of the VariableObject. The global object is created before control enters any execution context. The global object is the same as the global contexts VariableObject. In the HTML DOM; the window property of the global object is the global object. Now variables of functions are similar, but we can’t access them as properties. ECMAScript has an Activation Object. When control enters the execution context of a function, an activation object is created and associated with the execution context. an arguments property (referred to as a binding in ES5 spec) that has the DontDelete attribute (configurable set to false in ES5). The activation object is then used as the VariableObject. which is why we can’t access the members as properties. I know this is not property specific, but it was something I thought noteworthy. This should be useful for detecting what your users browsers are capable of EcmaScript wise. The project lead is Peter Higgins (Dojo Toolkit project lead). Has a good sized group of committers. May have potential to be a better Modernizr. Explanation of has.js features here.